The Spectra Energy facility – known as Steckman Ridge – is a 12-billion cubic feet underground natural gas storage reservoir with a 5,000 horsepower compressor station, 13 injection/withdrawal wells and related pipeline infrastructure in Monroe Township (Bedford County) Pennsylvania. It is located near the Maryland border, about two hours from Washington, DC. On the evening of March 9, neighbors heard snapping and popping sounds like fire crackers coming from the facility; then they saw what looked like smoke coming from the compressor station. They called 911 and fire trucks from the nearby town of Everett rolled to the scene. The noise lasted 2-3 hours, according to neighbors. Spectra Energy’s initial response was autocratic and dismissive: “Nothing was released. There was no smoke. No incident.” This was from Marylee Hanley, a “Director of Stakeholder Outreach” located nearly 500 miles away in the greater Boston area. Then the story began to change, thanks to the persistence of nearby Property Owner Angel Smith and Associate Editor Elizabeth Coyle, of the Bedford Gazette. They kept the pressure on Spectra Energy and the Pennsylvania Department of Environmental Protection (DEP). With its initial “no incident” response crumbling, the company apparently substituted a different Director of Stakeholder Outreach from its Houston headquarters. This one, Andrea Grover, admitted what the Pennsylvania DEP had already acknowledged: There was a release of methane and other hydrocarbons; but so far the company refuses to say how much. But as reported in the Bedford Gazette, Spectra Energy is legally permitted to emit literally tons of pollutants per year from this single facility. For example: 50 tons annually of volatile organic compounds; 25 tons of hazardous air pollutants, according to the DEP. If that weren’t enough evidence of ongoing problems with Spectra Energy operations – as recently as December, the Pipeline Hazardous Materials Safety Administration (PHMSA), issued Spectra Energy CEO Greg Ebel a “Final Order” and civil penalty of $134,500 related to various violations across several states. Included in this Order, the company was cited for failure regarding valve inspections. The Notice alleged that between 2008 and 2011, multiple valves at Spectra Energy’s pipeline division (Texas Eastern) facilities in Texas, Louisiana, and Arkansas had not been partially operated as part of the annual inspections. 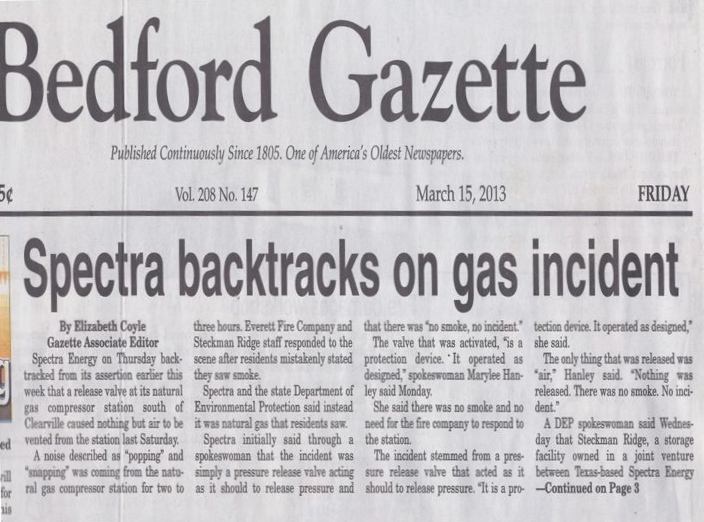 Regarding valve problems and methane emissions at its Steckman Ridge facility, Spectra Energy initially maintained that there was a normally operating valve release of “air,” according to the Bedford Gazette’s account. Then the company admitted (emphasis added), a “small pressure relief valve was activated when the valve detected a higher than normal pressure in that section of the station.” As a result, a “small volume of natural gas” was released, according to the report in the Bedford Gazette. Since the company is committed to the word “small,” why not answer the question about how much and exactly what was released? But this incident and Spectra Energy’s defensive behavior raises more questions. Was There An Unexpected Event? “The first thing I thought of was a relief valve opening and closing because they open and close with tremendous pressure applied to the valve and the instantaneous starting and stopping of flow through the valve is noisy, given the high pressure. This is yet another question that Spectra Energy has, so far, declined to answer. Will the Pennsylvania DEP pursue this question with the company? 1) Top Civil Penalty Ranking from EPA – Spectra Energy’s Texas Eastern pipeline division is ranked number seven on the EPA’s list of the “Top Civil Enforcement Cases Based on Penalty Assessed Through EOY FY 2009.” The National Enforcement Trends (NETs) document on the EPA website shows a $15 million penalty for discharging highly toxic PCBs – polychlorinated biphenyls – at 89 sites along the company’s 9,000-mile gas transmission pipeline running from Texas to New Jersey. 3) Underground Natural Gas Reservoir Explosions – Spectra Energy’s underground natural gas storage reservoir outside of Houston (Moss Bluff) experienced catastrophic failure in 2004 with two explosions, 6 1/2 days of fire and two evacuations. An estimated 6 bcf of natural gas was consumed during the fire. 4) “Unlawful Conduct” at Steckman Ridge– The Pennsylvania Department of Environmental Protection (DEP) issued two Notices of Violation in 2009 for Spectra Energy’s “unlawful conduct” during the first year of operation at its Steckman Ridge compressor station in Clearville (Bedford County), PA. Spectra Energy’s “unlawful conduct” violated air quality and clean stream regulations of the Pennsylvania Code, according to the Pennsylvania DEP. 3 Understanding the Corporate Culture in its own words: Definition of lying as a defense – Spectra Energy filed a 32-page report with the Federal Energy Regulatory Commission (FERC) exonerating itself regarding complaints about abusive and unethical behavior toward landowners as part of its 12 billion-cubic-feet underground gas storage reservoir in Clearville, PA, known as Steckman Ridge. NOTE: This article is cross-posted on the Accountability Central website at this link: http://www.accountability-central.com/nc/single-view-default/article/spectra-energy-retreats-on-methane-incident/ Accountability Central is part of the Governance & Accountability Institute, Inc.